Many producers of radios equip the majority of their products with RDS, increasingly even home radios. In order to enable servicing RDS radios, it is essential for the repair shops to obtain an RDS generator. This device will enable them to provide the necessary facilities for checking and repairing such radios. 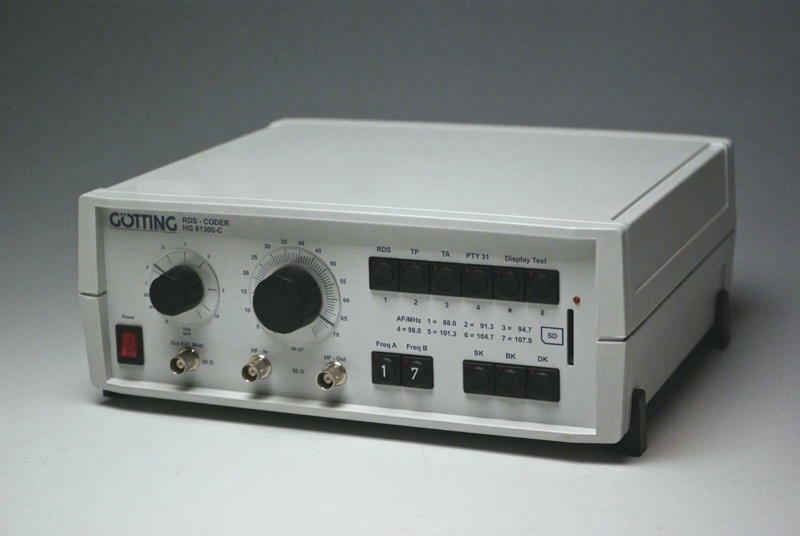 The RDS Service Generator HG 81300-C is a function generator for checking the most important RDS/RBDS/MBS functions (EON, TP, TA, PTY, PS, AF, CT, RT, TDC, IH, RP) as well as other elementary functions of modern VHF receivers. It was developed in co-operation with one of the leading producers of car audio equipment and is excelled by being an exceptionally low priced alternative compared to other measuring devices. The wide variety of available connections simplifies the adaption of the RDS generator HG 81300-C to specific testing assemblies. In addition, a PC interface combined with the appropriate PC software enables an easy generation of any RDS group types. For the American market, there is a PC control software (MS DOS version) available that enables testing RBDS features. The coder is software compatible with the former version HG 81300-B. * = Broadcast information for motorists. Click on a title to unfold/fold the corresponding info box. Program for Microsoft® Windows® (32-Bit and 64-Bit) for the RDS Generator HG 81300-C, .Net Framework 4.0 Client Profile or higher must be installed on the Computer. Unzip the ZIP archive and start the Program RDS Control.exe by double clicking the file. Information about the program usage can be found in the device description. Program for Microsoft® Windows® (32-Bit only) for the RDS Generator HG 81300-C, includes .Net Framework 2.0. Unzip the ZIP archive, then start the installation by double clicking on RDS_Control_Setup_1_6_1.exe. Programming Interface for Microsoft® Windows® in the form of a Dynamic Link Library (DLL) for remotely controlling and programming the RDS coder via the serial interface. With "RDS HG81300C.DLL" you can integrate the RDS coder into your existing RDS applications (Windows 32 Bit). "RDS HG81300C.h" description of all API functions. "RDS HG81300C.lib" needed for linking.